Art or Similar, 1971, was part of my andergraduate thesis at the Faculty of Architecture and Urbanism of the University of São Paulo, IGW at the time, Integrated Graduation Work. 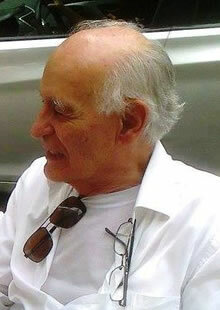 I had the guidance of Flávio Império, Architect, Set Designer, Costume Designer and Professor. We divided the work into three parts: a theoretical text where art and the artist were discussed; an exhibition of works done throughout 1969 and 1970 and the design of a residence. Vilém Flusser, a philosopher and professor, visited the exhibition that was held in the Institute of Architects of Brazil, in São Paulo, and after seeing the whole thing without saying a word, invited me to listen to his lecture at the São Paulo Academy of Letters, near by. At the end of his lecture about Marxism, he said: "I am sorry, but I do not understand very well about this subject and who actualy understands it is that young man sitting back there, from whom I have just seen an exhibition and whom I am inviting to be my assistant. Do you accept? I accepted. And I became a professor. carrying papers in his hands, would explaining "it's a process or similar." I thought it was appropriate.